Lady of the moment has to be Bollywood Goddess Priyanka Chopra, who makes her Hollywood debut this month in BAYWATCH. From winning the Miss World Pageant in 2000, to a massive Bollywood career, then becoming the first South Asian to headline a hit American TV show QUANTICO, Priyanka Chopra is proof that in the current Age of the world wide web, there are no more geographical boundaries to international fame and glory! Priyanka is a true citizen of the world; TIME magazine named her to their list of 100 most influential people in the world. Born in India to two army physicians, she grew up in army barracks playing with loads of other kids. She says her most vivid memories of her childhood were of racing up the hill at the army base where she lived to walk around a giant Stupa – must have brought her loads of luck! She moved to Massachusetts, USA to study at 13 years of age where she was teased for her skin colour; her classmates called her “Brownie”. That was when her dad told her being different was a strength, not a weakness. She took that as her mantra, and hasn’t looked back since. She is the first in her family to make a career in showbiz. The decision was sort of thrust on her after winning the Miss World title in 2000 when she had just turned 18. That was when she was applying to College, but becoming a world-renowned beauty queen brought loads of recognition her way. Offers for film roles poured in and that started her career as an actress. That was in India of course, and to date, she has made over 50 Bollywood movies. But Priyanka set her sights far further afield than just India and she never stopped looking out for opportunities to make it in the big movie world of Hollywood. Hers was a positive mindset and she never stopped believing it would be just a matter of time before someone would spot her! She must have set out powerful signals into the Universe! In 2015, she landed the role of Alex Parrish in ABC’s spy thriller QUANTICO, making her the first South Asian – a foreigner – to headline an American network series. Quantico has completed two seasons, with filming beginning now on the third. This year sees Priyanka breaking into Hollywood, playing the deliciously evil villain in BAYWATCH, the remake of the David Hasselhof 80’s hit show of bodyguards in barely-there bathing suits. To date, reception has been lukewarm to the movie… but Priyanka has moved on and word is out she is negotiating a BIG role in a new superhero movie! The Rock is a BIG star. We are not surprised that having caught his eye, Priyanka is sure to be the next breakout star. Only a matter of time! 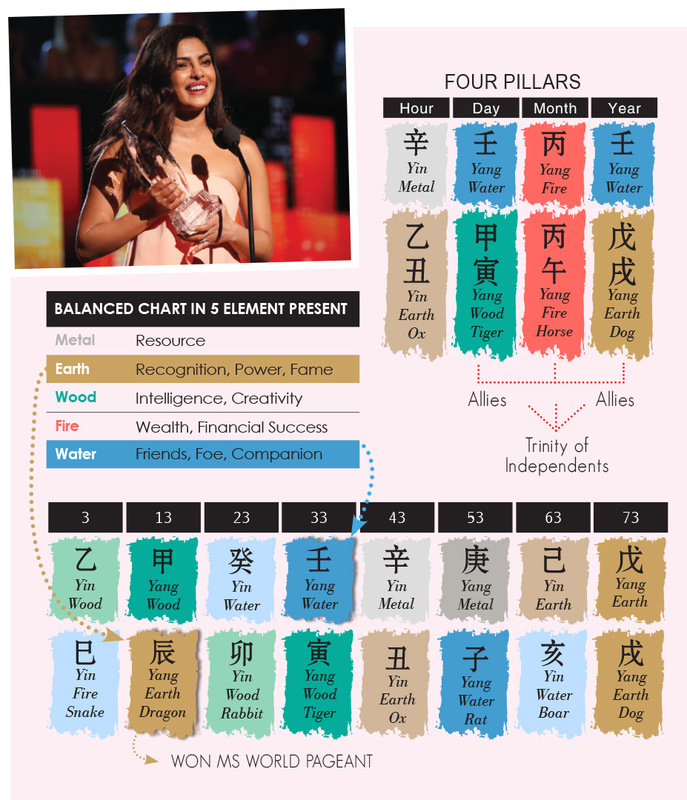 If you look at Priyanka’s Four Pillars birth chart, it shares, remarkably, many similarities with Dwayne Johnson’s chart. Her chart too has all five elements present, making it very well-balanced, hence a very lucky chart. And like Johnson’s chart, her Earthly Branches are also made up of allies. She has the Dog, Horse and Tiger in her Year, Month and Day Pillars, which together form the astrological Trinity of Independents. While Baywatch’s performance at the Box Office may have been disappointing, critics had an issue with the storyline, not the acting. And the point for Priyanka Chopra was to get herself out there and seen. Accepting the part of the villain in a comedy may have been part of the strategy, as she has hinted she would love to play a Bond villain, but more than that, she would love to play a superhero. Says Priyanka, “When I think of American movies, they’ve had superheroes for eons, right? So I definitely want to play a superhero. I don’t know… Batgirl would be so cool.” They have just announced a new Batgirl show to be directed by Joss Whedon, who wrote and directed the Avengers movies. Beyond that, no other names have been attached, and Priyanka Chopra has just announced her interest. Who knows? This year’s Wonder Woman starring Israeli actress Gal Gadot has been outperforming itself, so taking on a foreign lead for Batgirl could be the way to go. Priyanka Chopra has already proven herself on QUANTICO, where she plays FBI agent Alex Parrish. While she’s no doubt a chameleon, playing the bad guy with as much gusto as the good guy, having watched her as Agent Parrish, I must confess she suits the heroine roles a lot better. Next year is the year of the Earth Dog, a Double Earth year, and Earth is Priyanka Chopra’s Fame element. Her first big break came in an Earth year, that of the Dragon, when she won Miss World in 2000. It was also a strong Earth period according to her Ten Year Luck Pillars. 2015 when she broke into American network TV was also an Earth year, the Year of the Sheep. 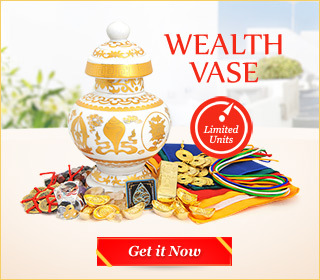 2018 will be the Year of the Dog, and could be yet another rung up the ladder for Priyanka’s quest to conquer the world. We wish her the very best!